Large shaped incontinence pads are designed for sufferers of moderate to heavy incontinence. Many will feature wetness indicators making it easier for individuals to know when to change. 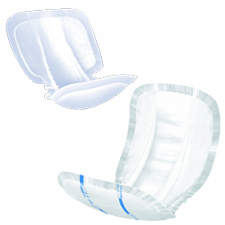 The large shaped pads are designed to offer superior levels of absorbency. They function best when worn with stretch support pants which hold them close to the body for a more secure fit.